Smoke testing is a method used by utilities to check for infiltration of rainwater into a sanitary sewer system. Smoke is introduced into the wastewater system and observations are made to detect potential areas of concern. Smoke coming out of the ground will show us where there may be a defect in a line or where a clean out cap may be damaged or missing. Smoke testing is very important to our ongoing operations to keep our system in good condition. The smoke is non-toxic, non-staining, has a slight odor, is white to grey in color, does not create a fire hazard, and cannot harm humans or pets. 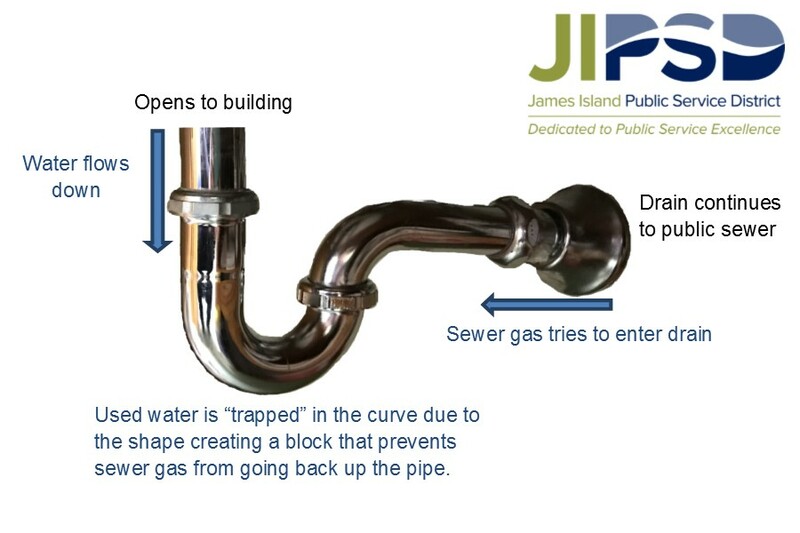 The JIPSD will be conducting testing around James Island beginning February 2017 and lasting through Fall 2018. Will I Receive Notification Before My Neighborhood is Tested? Yes, a notice will be placed at residences 2-7 days before testing will occur. As smoke runs through the system, it is normal for the smoke to escape from the vent on your roof. If you experience any smoke inside your home, it is indicative of a plumbing issue within your home and should be addressed with a plumber to make sure sewer gasses are not escaping into your home. • Smoke from roof vents or manholes. • Smoke inside or under your home- can indicate issue with plumbing. • Smoke from roof gutters- can indicate an improper drainage connection. • Smoke out of drain- can indicate a dry water trap or no trap present (see picture at right). • If you think there is an emergency- please call 911! There is no need for you to be home during the test. If you think there is an emergency, please call 911! If you have any drains that are used infrequently, it is important to run water in those sinks before the smoke testing is being performed (at least a gallon). This will fill your water trap and prevent smoke and sewer gasses from entering your home. If you have questions or concerns, please contact Wastewater Services at (843)762-5258.